The country’s largest urban cultural park, Balboa Park, has been one of my favorite San Diego spots since childhood. I can remember taking class field trips to the many museums, my 8-year-old self awestruck by their enormous grandeur. As an adult, I still love visiting Balboa Park. No matter how many times I wander the park’s vast Spanish Colonial walkways, I always find something new and exciting to explore that awakens my inner 8-year-old spirit. Legendary designer Zandra Rhodes serves as the honorary chair for this annual exhibition and special event gala at the Timken Museum of Art. Fashion enthusiasts will be bowled over by the extraordinary fashions inspired by 15 artworks from the museum’s collection. Proceeds from tickets to the grand celebration on Saturday, Sept. 24 benefit the Timken’s art education programs, and Art of Fashion programming will continue at the Timken through October. Fashion certainly plays an important role in this ground-breaking show that launched a cult phenomenon. The Old Globe’s stage production features all the outrageous music and characters created by Richard O’Brien, who wrote the original book, music, and lyrics for The Rocky Horror Show. Do the time warp back to Dr. Frank ‘N’ Furter’s castle as it was meant to be seen – live onstage. The show runs through Nov. 6. On view through Nov. 6, this momentous exhibition spanning five centuries showcases 64 masterful pieces from Spain’s most celebrated artists, including Pablo Picasso, Juan Gris, Joan Miró, and Salvador Dalí. In addition to the big names, visitors will discover works by artists little-known in the U.S., such as the Romantic Manuel Barrón y Carrillo, or the Modernist Romero de Torres. From the Spanish masters to masters of photography, Balboa Park’s art museums are some of the best in the country. Be sure not to miss Imagine That! at the Museum of Photographic Arts, now through Oct. 9. Expect to see the unexpected in this exhibition that highlights unique perspectives, unknown realms and phenomena inaccessible to the naked eye and immediate senses. 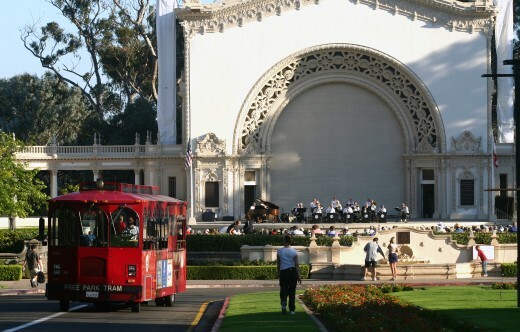 Donated to the City of San Diego by John D. and Adolph Spreckels in 1914, the Spreckels Organ is one of the world’s largest outdoor pipe organs, containing 4,530 pipes that range in length from the size of a pencil to 32 feet. Since 1917, San Diego has had a civic organist, who performs free weekly Sunday concerts. Want to experience all the Balboa Park has to offer for free? Leave a comment on this blog post to be entered to win two Passport to Balboa Park certificates. Each Passport includes a one-time admission coupon to each of 14 museums, and the coupon booklet is valid for seven consecutive days. A winner will be chosen at random on Wednesday, Sept. 28, so be sure to post before 10:00 am on Wednesday! This entry was posted in Arts & Culture, Insider Tips and tagged art, arts, balboa, culture, diego, month, museum, old globe, organ, park, pavilion, san, spreckels, timken by Candice. Bookmark the permalink. Congratulations Heather! You won two passports to Balboa Park. Please contact me at sravitz@sdcvb.org and we can get those to you. Thank you to everyone who commented!! I love Balboa Park. It’s one of the places that makes San Diego so wonderful. I love Balboa Park. Reminds me a bit of back east but way more museums and events. Beautiful! and a friend is getting married in the Japanese Friendship garden…. I love San Diego, and am so happy to see that Balboa Park is just as beautiful as it was when we lived there 30+ years ago! Maybe even mor beautiful! We were just there, walking the park, but had not planned to visit museums. We decided that will be on our agenda for next visit! My girlfriend and I are headed to SD next week and would love to spend a day exploring the museums in Balboa Park! I take everyone who comes to visit me to Balboa Park. It makes me very proud of San Diego to be able to do that—-we’re the luckiest people in the world, eh, San Diegans? One of my favorite places in san diego!! My hubby and I really enjoy going to Balboa Park! I especially like the great architecture. Did you know that parts of Balboa Park were used as Charles Foster Kane’s estate called “Xanadu” in the greatest movie of all time, “Citizen Kane”?! Balboa Park is my favorite spot in San Diego, no matter rain or shine. And I always suggest my friends to go there when they come to San Diego. I love Balboa Park but have probably only been to half the museums. This would be a great activity to do with my daughter if I won. Thanks for another great giveaway. I like to wander into museums not knowing what the special exhibit at the time is, that way I’m almost guaranteed to learn something new. Love, love Balboa Park, my favorite place on earth. Balboa park is one of my favorite places to be! MOPA is my favorite museum. I love Balboa Park, so far I have only been to one museum. This would be a great opportunity to visit all the great museums Balboa Park has to offer. I love Balboa park. I used to go all the time when I lived in the area. Balboa Park is where I made my vows of marriage last year in May. The art, architecture, plants and trees, fish, and even the wildlife scattering near my feet created a warmth and richness forever secured in my memory. There were places within the park I could share with others and places where I was able to reflect in solitude. It welcomes all. I am coming here in October bringing my 8 year old daughter. We have been there before and just love it. She is really into art and history just as much as I am! So this is a great place to come and visit. We are coming for my birthday! Wow there really is so much to see at Balboa Park. I frequent with my daughter CeJae (3)and she just loves it all so much, but I admit would be nice to explore sans a sticky toddler!! I absolutely love san diego ! It has so much rich culture to embrace. And balboa park has it all. Beautiful architecture. And many wonderful museums with much history and art. I really do love all of the arts exhibits that Balboa Park has to offer. Such a historic and beautiful place!